The entire cryptocurrency market bled cash in the last week to hit new lows. The move was swift, unexpected, and left many traders wondering if their holdings would be worth keeping, or if it was time to get out. While that question is yet to be answered there is one thing that can be said, low volatility and Bitcoin Cash are to blame. The cryptocurrency market had been trending at a stable support level for many months. Bitcoin itself had stabilized around the $6,250 level and seemed content to remain at that level indefinitely. Cryptocurrency markets have been waiting on US regulation, along with global regulation, to clarify what, how, and where cryptocurrency can trade. So, the Bitcoin Cash Hardfork gets thrown into this atmosphere of low volatility. The high-profile coin is itself a fork of the Bitcoin chain and now its own developers are fighting on how to proceed. Specifically, there are two mining pools that command large blocks of voting power vying for dominance. The initial announcement of the hard-fork had BCH prices moving higher as miners and holders anticipated free coins. The bad news is that uncertainty around the hard-fork sent traders running for the exits and the led to a mass sell-off in BCH just as the hard fork was set to happen. BCH itself fell more than 18% the first day of the mass selloff and has since extended that loss and hit a new all-time low. BTW, the hard fork was successful, there are two new coins. The problem for BCH is limited to Bitcoin Cash and its internal squabble. The bad news is that it has had a damaging affect on Bitcoin prices that may lead them lower. The good news is that the indicators, both stochastic and MACD, are already showing signs of support that are confirmed by candlestick action so there is hope a deeper decline is not on the way. More likely, once the market begins to comprehend the nature of this sell-off it will become a buying opportunity for HODL’ers and traders alike. 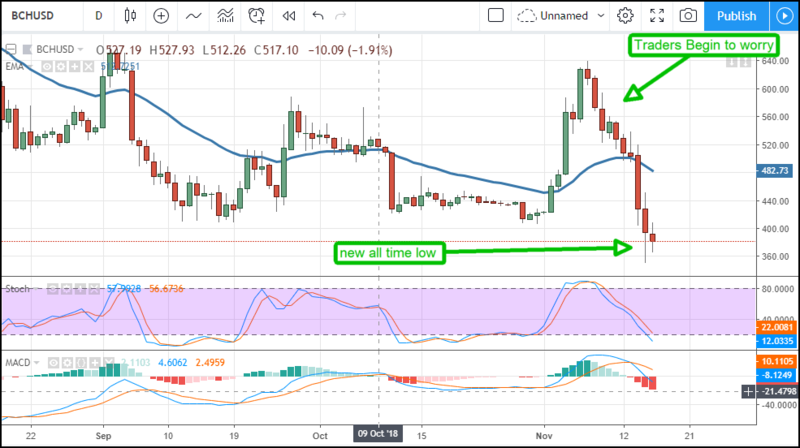 Other coins, like Ethereum and the Basic Attention Token, did not set new lows. 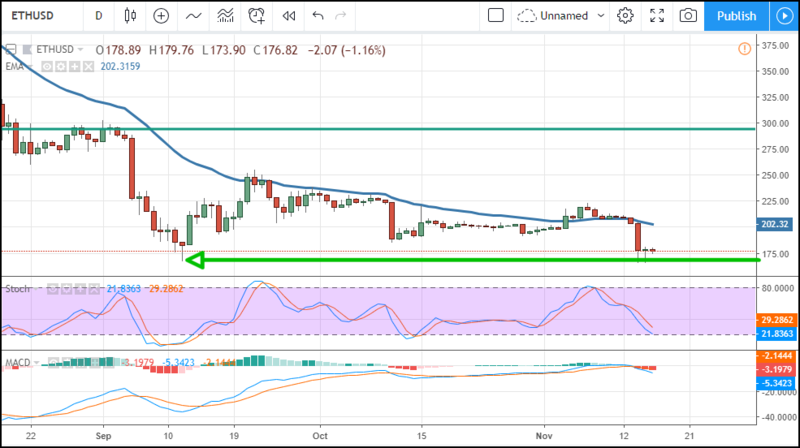 The Basic Attention Token was able to hold support well above the bottom of its trading range while Ethereum was able to hold at the long-term support level of $176. Does this means cryptocurrency is going to snap back? Not necessarily but there is a good chance. The value of digital block chain technology is there, and now the coins are cheap again, so money should start trickling back in. Also, I still expect the SEC and CFTC to announce some form of cryptocurrency regulation and that will be a sure catalyst for higher prices.